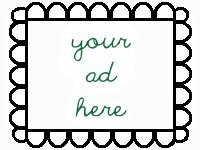 Today I'm going to feature two amazing jewelry artists ~ I discovered both this morning and by this afternoon I still couldn't choose one. I'm also going to (more or less) let the pictures do the talking today. Both shops are completely unique ~ a quick glance through NinaGibsonDesigns reveals clean lines and a predominant use of silver metal, occasionally accented with copper. Jantar's shop, on the other hand, is filled with classic designs in bright, beautiful colours. Here's a small selection of my favourites from these two fantastic shops. 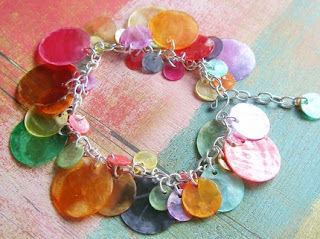 First is the cool simplicity that is NinaGibsonDesigns. 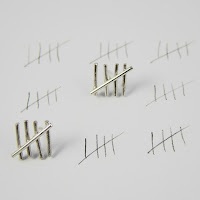 These cute little tally mark earrings are exceptionally clever and delicate. Unassuming and extremely charming, they would make a perfect addition to any outfit. 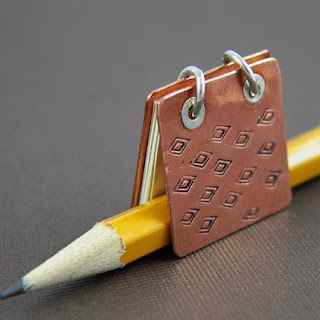 Another sweet and clever design is this copper book pendant ~ isn't it adorable? As an avid reader, this little book would be perfect to add to my collection. Furthermore, the pages are made from card, and are replaceable. What a thoughtful and personal gift (especially if it were filled with sweet nothings from your paramour)!!! 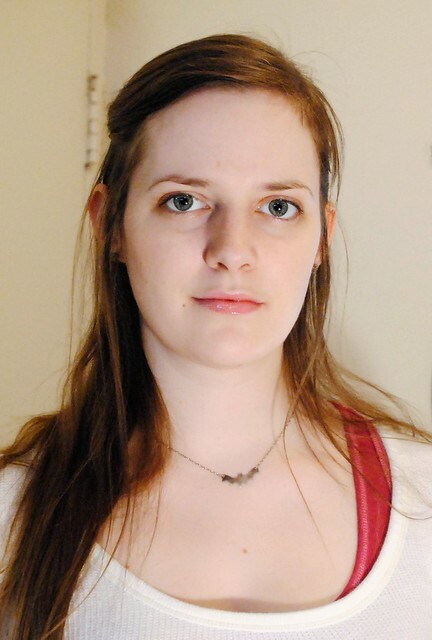 NinaGibsonDesigns also has some fall designs in store that you should definitely check out. 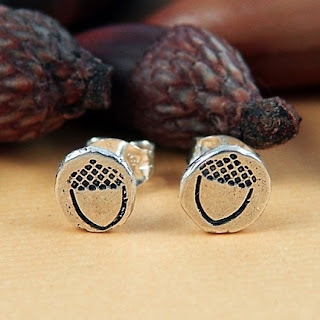 My favourites are these acorn earrings and this gorgeous pumpkin charm. I love the different textures you will find in Nina's metalwork. 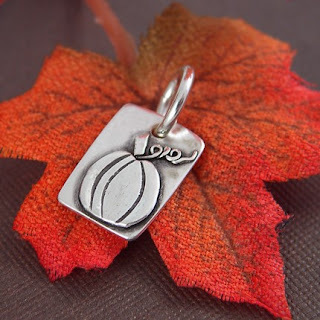 The acorns are stamped into the silver while the pumpkin is raised, another layer. The curl on the stem is to die for!! 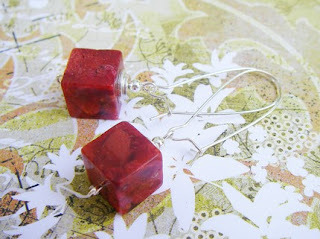 First up are the sponge coral cube earrings, which have a beautiful pattern in the coral. The deep burgundy colour is sure to look stunning throughout the fall season and ease you well into Christmas. Don't they remind you of wrapped gifts? 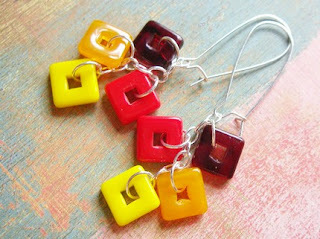 The second pair are the sunset square earrings, and the bright colours mixed with a bold geometric shape make for a brilliant statement. I absolutely love this colour combination: the bright lemon, cantaloupe and cherry offset the deeper burgundy quite nicely. Both summery and fall, and perfect for any celebratory occasion. Last but not least is one more fall leaf set: Called dancing leaf earrings and necklace set, this autumn leaf combination is perfect for all seasons. 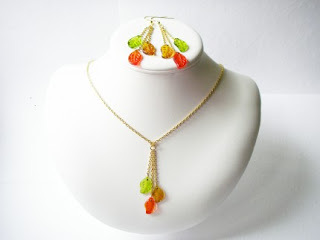 The lime, topaz and orange Czech glass leaves are dazzling against the gold chain. 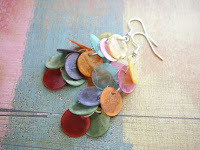 Another piece that makes use of movement, you can picture these leaves falling and dancing around your ears and collar. That's all for today, but these shops are stocked with many more stunning creations. Be sure to hop on over to both NinaGibsonDesigns and jantar! Thank you for your beautiful remarks about my work! 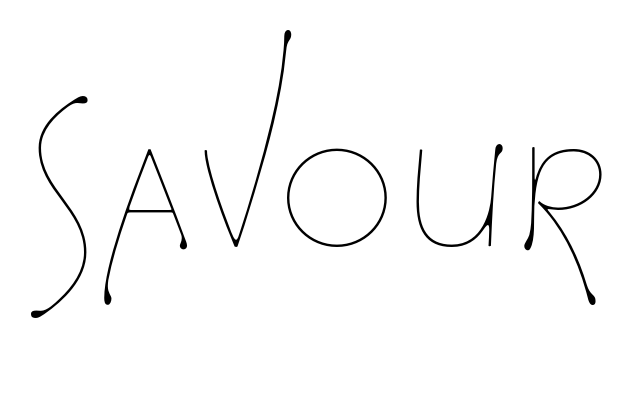 You have a lovely blog! Finally, what have I been up to? Can it be? A new posted item!! !